Growl Of A Soft Centred Lion. John Martyn fan Sineve Soe talks to the singer/ songwriter about life, love and unhappiness. Have you seen the ruin?” I ask Daisy Flowers, girlfriend of Scottish singer-songwriter, John Martyn. “The ruin? Yeah, he’s asleep!” Daisy says, laughing in the sunny lounge of Clonmeen Lodge, where the couple are relaxing for a week. The ruin I was actually asking Daisy about was Clonmeen Castle across the road, but obviously John Martyn has found a good woman in Daisy — she’s full of wit and has a crazy humour which, according to rumours surrounding the John Martyn camp, is sometimes much needed. The couple met three years ago when she became his tour manager. After a solid year on the road, Martyn needed a break and when they met months later they realised they had missed each other in a special way. For the past two years, they’ve been lovers. The photographer arrives and I tell him John Martyn is having a little snooze. “Oh, I don’t mind waiting,” Michael says. “I’ve been a fan of his for years . . .” So have I and I’ve come here to try to find out where Martyn’s songs come from and why he never made the big time. This is an artist who has released 29 albums in 30 years, who was the first artist ever released on CD, and yet it is impossible to find more than a few albums of his in the shops. Why? Suddenly the light disappears in the lounge as a huge man walks into the room. It’s John Martyn stealing the sun. He has a big grin on his face, dark sunglasses and hair messy from sleeping. “How are you?” he asks, shaking my hand with so much force that I’m afraid it’ll fall off. “Let’s go and do it, shall we?” We leave the staff and friends behind us and walk over to an old stable converted into a two-storey guesthouse. “I love this place,” Martyn says. “The other night, I stayed up reading Conan Doyle’s Sherlock Holmes until six in the morning. When we got up at 3pm, not expecting anything, they asked us if we were ready for our breakfast! John Martyn, 47, grew up in his grandmother’s house in Scotland. It was a huge house, and just after the war the family was forced to house all kinds of refugees who desperately needed somewhere to stay. Martyn remembers the first few years of his childhood as something like a railway station, with strangers leaving and arriving all the time. He was an only child. “Maybe my parents saw me and thought: ‘Oh my God, enough is enough!” he grins, and goes to the fridge and pulls out a bottle of vodka. Half vodka, half coke in a big glass, knocked back in one go. “I don’t drink socially, I drink for the high,” he explains. When I point out that a lot of people don’t think drinking is a high but a low, he gives me a look like he could strangle me any minute. A BEAUTIFUL horse comes up to the window that overlooks the field and brushes its face against the window. “My dear friend, how are you today?” Martyn says gently to the horse. Then he turns to me. A lot of John Martyn’s songs are about being in love or saying a difficult goodbye, regretting or being relieved. He has been married twice — the second time to Irish woman Annie Furlong — and has had numerous affairs and relationships, resulting in him fathering 11 children. Martyn wanted to be a doctor when he was younger, but instead he studied philosophy and English at Cambridge University, and it was then he was asked what he thought about becoming a pop star. He did have a ‘real’ job for a while though. “Yeah, I was a professional poker player in the States for two and a half years. 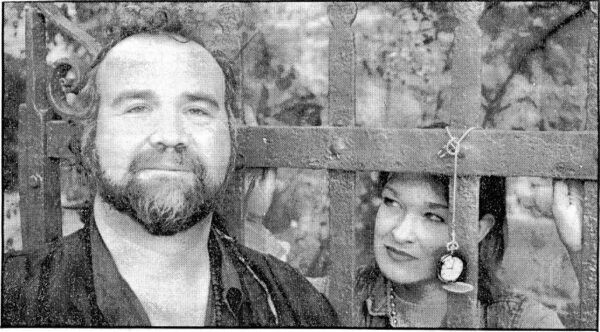 John Martyn’s old friends are still in love with him, even though “they have put up with quite a bit through the years”. Before the interview, I spoke to some of them and they all said he was a bit self-destructive at times but a very caring, generous person with a large and warm heart. “Did they really say that? Hmm … that’s really flattering isn’t it?” John Martyn walks over to the fridge — time for a quick shot before joining the rest in the lounge, where the hostess and Grace Kelly lookalike Catherine O’Leary mixes more drinks. One of Martyn’s friends has arrived with a guitar and soon the old piano is opened as a jam session starts, his voice stretched out in a haunting growl like a lion without a mate. But John Martyn’s mate is there, smiling to him from a high barstool. John Martyn’s new album And is out now on Go!Discs.